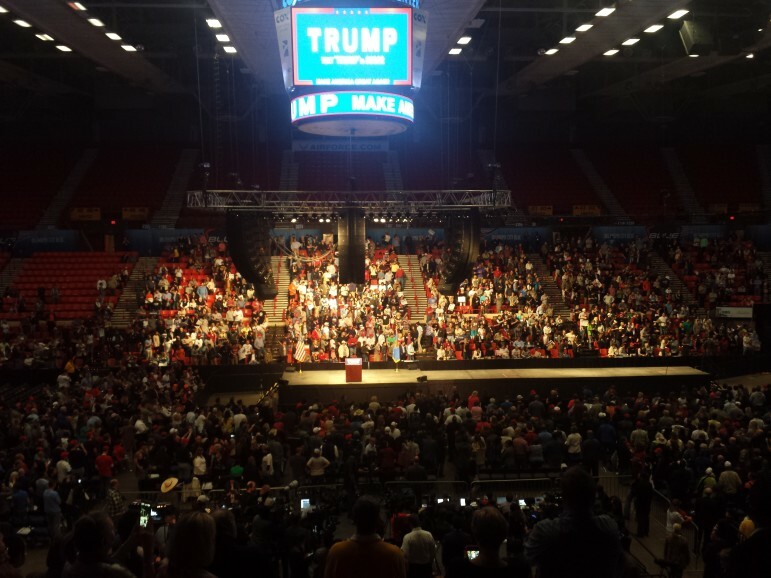 The Trump rally at Oklahoma City’s downtown Cox Convention Center drew as man as 7,000 supporters. Oklahoma’s Republican presidential primary is a race for second place, according to two recent polls that show Donald Trump with a commanding lead. Polls released in the past two days by SoonerPoll and Monmouth University show more than 35 percent of Republican primary voters will go for Trump in Oklahoma, giving him a double-digit lead in the state over his closest contender. Sens. Ted Cruz and Marco Rubio are in a race for second place, separated by fewer than three percentage points. Bill Shapard, chief operating officer of SoonerPoll, said polling showed many Oklahoma Republicans are throwing their support behind Trump because he is a political outsider. Republican voters appear to value a candidate who can bring change over a candidate who can win in November. Trump has strong support among men, women, evangelicals and residents in each congressional district. Poll results also show Ted Cruz lost support among evangelical after the Iowa caucus. Shapard said that’s because evangelicals turned against Cruz for his perceived dirty election tactics in the Hawkeye State, where he claimed Carson dropped out of the race. Instead, Oklahoma’s evangelicals appeared destined for Trump.